Ragnarok is something of a cyclical purge. Entire worlds are destroyed, people and traditions erased. There’s a lot of death during a reckoning, so it’s only fitting that the goddess of death (Hela/Cate Blanchett) be at the center of it all. Thor’s imprisoned somewhere at the other end of the universe and ends up becoming a gladiator for the Grandmaster (Jeff Goldblum), an eccentric intergalactic leader with a penchant for bold '70s décor. It is in the arena that Thor (Chris Hemsworth) meets up with Hulk (Mark Ruffalo). After some comical prodding, Thor convinces Hulk to help him save Asgard (Thor's world) from certain doom at the hands of Hela. 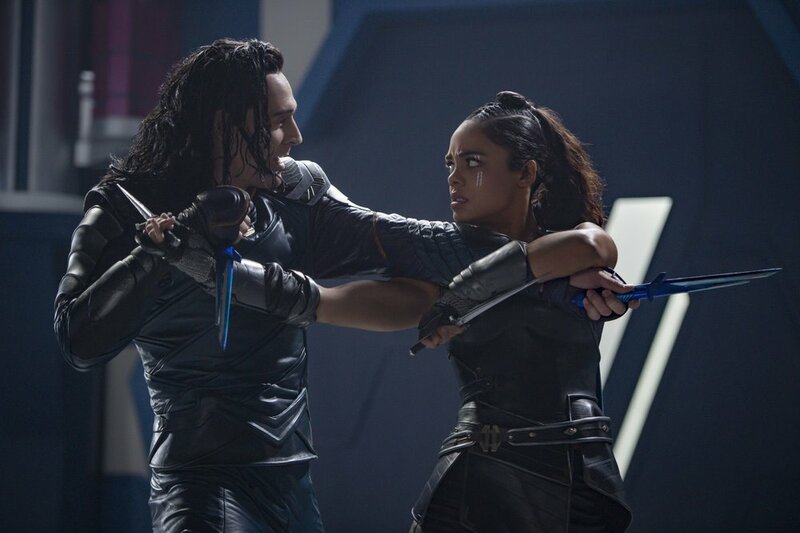 Thor knows he’s going to need more help than that so he ends up enlisting both Valkyrie (Tessa Thomson) and Loki (Tom Hiddleston). Together, they aim to save Asgard from extinction. As is customary, Chris Hemsworth delivers a ridiculously charismatic performance as Thor. He gets a haircut, survives even more familial trauma and defeats a fiery demon-god all while cracking jokes with his buddies the entire time. Hemsworth’s comedic timing as Thor is impressive. He dials it back considerably when he switches from "buddy mode" to "hero mode" but it’s never abrupt. His performance is smartly self-aware but never gratingly so. Tom Hiddleston is delightfully sleazy as Loki. In fact, I like him best when he is Loki. He’s too much of everything which is interesting mostly because he’s so elegant in his execution of this portrayal. Tessa Thompson provides some much-needed contrast as a messy and endearing Valkyrie. It’s precisely her performance that helps to swiftly develop Valkyrie’s vulnerability on screen. Thomson makes her character into something that's more than simply endearing and that’s exciting to see, especially coming from someone in a supporting role. In fact, all the supporting actors in Thor: Ragnarok (from Jeff Goldbum to Mark Ruffalo) brought their A games, enhancing every subplot along the way. Cate Blanchett as Hela was the entire reason I went to an actual theater to see this movie. The woman never lets me down, so I figured why not? Blanchett uses her innate elegance to make an incredibly abrasive character alluring. She’s Thor’s greatest adversary yet, the personification of power and ambition. Blanchett gives Thor: Ragnarok what many comic book movies lack, a truly captivating adversary. I just wish there was more of her in the actual movie. Come to think of it, I wish there were more of Valkyrie too; both of these characters worked to keep an all too familiar storyline engaging. Thor: Ragnarok has a lot of great performances but it’s also a lot of the same old thing. Taika Waititi's (Director) storytelling is mercifully quick-paced and makes a somewhat repetative storyline appealing. He puts together a light-hearted look at "superhero problems" that's visually captivating and overall egaging from start to finish. All I want to know is what’s wrong with sacrificing a few moments of violence and destruction for a moment of character development or something? Not a damn thing if you ask me and no, I don’t care that you didn’t. What's more, is it just me or is there a touch too much CGI? It feels unnecessary with so many talented actors and a story that’s legitimately intriguing.